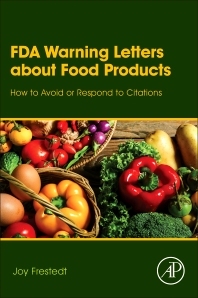 FDA Warning Letters About Food Products: How to Avoid or Respond to Citations uses examples of FDA warning letters about food products as training tools to discuss important quality and manufacturing issues encountered by food companies around the world as they bring food products into the US market. Focused specifically on FDA warning letters surrounding new dietary ingredients and dietary supplements, the book first introduces FDA warning letters in general. Each chapter then focuses on specific issues identified, including HAACP/quality systems, imports/exports, food contact issues, etc. This book helps the food industry train professional team members (across the spectrum of experience levels) to avoid common issues often cited in warning letters. It serves both as an authoritative reference on the common types of warning letters issued to food companies today, and as a guide to best practices for food manufacturers. Dr. Joy Frestedt has managed clinical research, regulatory affairs, and quality systems for more than 35 years and has published more than 100 manuscripts, book chapters. With a PhD in Pathobiology from the University of Minnesota Medical School, her experience includes designing, conducting and overseeing clinical trials as well as negotiating regulatory submissions and developing quality systems for companies like the University of Minnesota, Orphan Medical, Astra Zeneca Pharmaceuticals, Johnson and Johnson, Medtronic, and Mayo Clinical Trial Services. Dr. Frestedt also founded Alimentix, the Minnesota Diet Research Center and was named one of the “100 Most Inspiring People in the Life Sciences Industry” (PharmaVOICE, 2011) and one of the top 25 “Industry Leaders/Women in Business” (Minneapolis/St. Paul Business Journal, 2011).